Trivia HK-47 was voiced by Kristoffer Tabori and was the son of famous director Don Siegel. I read this as HK-47 is Don Siegel's son. And somehow it makes sense. On Return to Oz, that is one of those unique childhood gems I wonder if would hold up for me today. Maybe I'll find out sometime. I didn't see Return to Oz until I was well into my 30s. It's pretty good, though I could have done without the whole electro-shock therapy part. The poor guy in the Tik-Tok suit spent the movie doubled over to fit inside it. My back hurts just thinking about it. Maschinenmensch (AKA Parody, Ultima, Machina, Futura, Robotrix, False Maria, Robot Maria, Roboria and Hel) is a robot that appeared in the novel and more famously the film Metropolis. The Maschinemensch was created by the mad scientist Rotwang in his attempt to take control of the city of Metropolis. Rotwang gives it the form of Maria, a woman who seeks to bring the working classes and ruling classes together. Rotwang wants to ruin her reputation for his own ends and uses a fake Maria try to kill Frederson, a man who stands in Rotwang's way. However, the Maschinemensch would appear to lose control and go on to get men to murder each other. She would go onto manipulate the working class to cause a catastrophe under the guise of a revolt. For a long time, the motivation of the Maschinemensch remains something of a mystery. In a once-missing part of the film, Rotwang explicitly instructs the robot to pervert Fredersen's orders and help bring down his worst enemy, which helps explain her destructive behaviour. Different incomplete restorations of the film made since the original offered different explanations of the robot's behaviour (one, for example, saying that Rotwang has in fact lost control of the robot and it is not under anyone's control), or no explanation at all. The 2010 restoration, complete for all practical purposes, depicts Rotwang deliberately instructing the robot Maria, thus finally clarifying the gynoid Maria's motivation. Trivia When Rotwang shows Fredersen the robot, it is Brigitte Helm, not a stunt performer, inside the robot costume. Hedonismbot is a robot who appears in the TV series Futurama. Hedonsimbot is, as the name implies, a hedonistic robot who is modeled after a kline and an ancient Greco-Roman hedonist. He is completely dedicated to finding pleasure in various ways, usually in the sexual or gourmet variety (and most often with both mixed together). Despite his proclivities, Hedonismbot did once intend to get married but his bachelor party got out of control when his nuclear stripper had a meltdown of which he was the only survivor. Hedonismbot has a valet named Djambi, whom he has stated he has had robosexual relations with. He is also constantly seen eating grapes and is made of solid gold. He has great wealth as well, as seen when he produced Fry's holophoner opera. 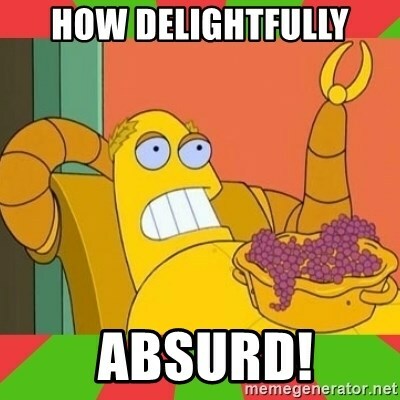 Trivia In a season three commentary, Matt Groening points out the importance of the name being Hedonismbot and not Hedonistbot - he is not only hedonist, he is the actual personification of hedonism. Nice! Something that was on my list and something I recognize. I like that Hedonism-bot has a his laying-down hedonism couch built in as part of his body. BMO is a robot/sentient video game system in the animated TV series Adventure Time. BMO was a robot in the MO line of robots and was the only one designed to have fun. BMO was created by Moseph "Moe" Mastro Giovanni, a master robot builder, who gave the name BMO as a short hand for "Be More", as was his hope for BMO. At some point, BMO became friends with the adventurers Jake the Dog and Finn the Human and acted as their live in video game system. BMO is also close friends with NEPTR, a robot Finn created and more or less forgot about. BMO also has a brother named AMO who is sort of his opposite: as BMO was made to give love, AMO was made to accept it. But AMO, being unable to give love (and therefore no would want to give him any) went mad. BMO is extremely childish in personality, due to being built for play, though over the course of BMO's life, he has slowly matured, in his way. BMO also has no fixed gender, accepting being referred to as a boy and a girl at different times. BMO also loves to pretend to be alive, a fantasy she plays out with her imaginary friend Football (who is BMO's reflection). BMO acts as a living computer and video game system, often coming up with new games for his friends, such as "Conversation Parade". Despite BMO's immaturity, BMO can be fairly sage and is always willing to listen to other people's problems and give advice. Trivia The heart, medal and scroll inside BMO may be a reference to the heart-shaped watch, medal of courage and diploma presented to the Tin Man, Cowardly Lion and Scarecrow at the end of The Wizard of Oz. BMO can be fairly sage and is always willing to listen to other people's problems and give advice. I am taking bets as to whether or not Game Boy from Captain N the game master will make an appearance on this list. Well, I might have but I only just within the past hour remembered the Captain N cartoon... and only minutes later did I recall there was a Game Boy character on the show. One of many, many robots eligible on this list who were voiced by Frank Welker. Fun Fact! Welker voiced some of the coolest Transformers AND the lamest of the Go-Bots!